recommended for: For fans of Gone Girl, I Was Here by Gayle Foreman, Cruel Intentions, and dark mysteries. I'm that annoying kid who sits next to you in the movie theater and guesses the ending halfway through the movie. But Suicide Notes had me guessing. With the twisty drama of Gone Girl mixed with teenage pathos, it's a fast-paced thriller and a heartbreaking story of friendship. It begins with Delia's death. June struggles to pick up the pieces, to reconcile Delia's shocking suicide with the girl she used to know. But don't expect another I Was Here or Thirteen Reasons Why. It really comes into its own when June begins to unravel the mystery of Delia's death. What she finds is crazier and more dangerous than she could have imagined. And the ending--well, lest I give too much away, all I can say is WHOA. Despite some shaky plot points and flimsy characters, it's a thrilling, heart-pounding read that I deeply enjoyed. I think this will be a divisive book--you hate it or love it--but it'll make you feel something. Suicide Notes really shines as a thriller. There's much less the somber, pensive tone that you find in so-called "issues" books--though there's plenty of angst, as we'll discuss in a minute. Instead, there's more of a mystery element. The comparison to Gone Girl is so apt (although don't expect quite the level of brilliance of Flynn, who's hard to emulate). It's the kind of book that teases and toys with you. You think you know what's happening at the beginning. Some of your guesses come true--and the others blow you away. It's difficult to discuss the plot without giving the magic away. What I'll say is that this book is darker and grittier than you're thinking, in the best way. everyone is keeping dark secrets. June never realizes what she's getting herself into. In her search for the truth about Delia's death, she comes up against a host of shady characters: Delia's emotionally unstable ex, the strangely intense Ashling, the dreamy-but-dangerous Sebastian. Even June's boyfriend is hiding something. Part of what makes this book fascinatingly frustrating is the fact that you can never get a handle on these people. And I know some of that is a bit of cardboard characterization, but it's also a testament to the dangers of the world June has entered. It keeps you from trusting anyone, and makes the read a tense one. This isn't a perfect book. For one, the characters are a little flimsy. June is more on the naive side than I was expecting, although I can imagine such a flavor of girl getting into her situation. Delia is next best. You almost come to know her more than June, which I think is telling of their intensely dependent relationship. June idolizes her, and so we come to know Delia as the vibrant, histrionic, edgy girl she is. But that's where it fades. Seb and his clan feel type-ish (though Seb is the best of the group) and Ryan is little beyond a boyfriend. It's difficult to connect with them. This makes it more difficult to forgive some of the book's more incredible elements. I won't spoil them, but there are a number of eyebrow-raising plot points, like surprisingly adept teenage hackers and that ilk. If you can look past those pieces--and I was really in the right mood to do that--then it'll be an exciting read. 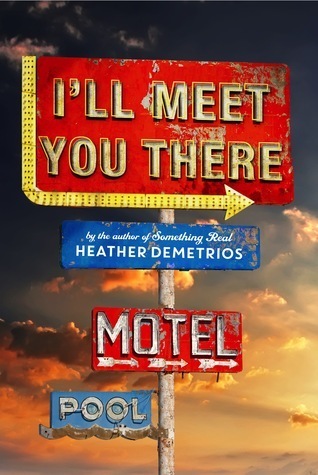 The narrative flips constantly between present-June narrating her experiences and past-June, in third person, in some of her most important moments with Delia. While I was a bit disappointed with "the night," other elements of the past were so interesting, and built up a sense of urgency and anxiety that amplified the thriller bits. Because you're flipping between the two, you're always trying to connect the pieces and guess what's ahead. It makes it easy for Weingarten to pull the rug from under you. and builds to a devastating emotional payoff. Maybe the ending was obvious to some, but I didn't fully see it coming. I knew it was a possibility, but I didn't think it'd happen until it happened. Weingarten's writing is pretty tight and emotional, so she knows how to play with your emotions. The book narrows into a tight downward spiral until you're racing through the last pages, trying to unravel the secrets of a toxic friendship, a dangerous love affair, an uncertain murder. And it ends with a bang. 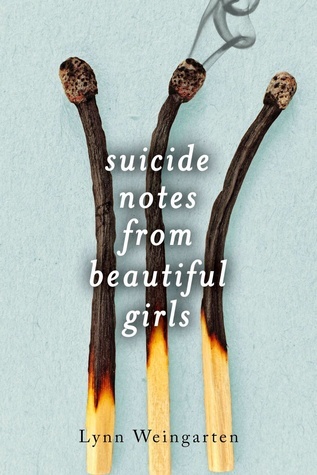 Suicide Notes from Beautiful Girls is a fast-paced thriller that messes with your head, lulls you along, and keeps you guessing until the mind-blowing end. will i read this author again? I probably will. I like her style.